Mine was the only vehicle at the pass when I pulled in after 7:30a. Though temperatures had been nowhere near freezing for the past week, the snow was well-consolidated and easy to walk on. With snow covering most of the ground at the pass, I had no idea just where the trail was, nor any need to know this. With snowshoes strapped to my feet I simply walked to the southwest, then up a moderately steep slope to reach the crest in little more than half an hour. Turning north, I spied Peak 9,960ft sticking up at the end of the crest before it drops down into Deadman Creek drainage. Since it was little more than half a mile away, I left my pack and snowshoes where I was and made the easy trek to visit the summit. I found an unofficial benchmark describing it as Mt. Finiski which seemed a better name. Later I found that Ski*Finis is a small group of folks who have been skiing the northeast slopes of the peaks each year since 1957 (I assume through a few generations of skiers), around the time of the Sonora Pass opening in spring, or in this case, summer. I took a few pictures and left a register. It seemed in need of one since, after all, someone had gone to the trouble of installing a benchmark. I returned south to collect my stuff and then continued on the crest in that direction. I used the snowshoes for one last section of moderate snow on the crest before strapping them on the back of my pack for the rest of the day. Beyond this, I found the PCT as it crosses the crest at the boundary of the Emigrant Wilderness just north of Peak 11,080ft. The trail here stays on the west side of the crest past Peak 11,080ft and Peak 11,245ft. I headed up to the first of these, an easy ascent, and then up to the second, only a little harder, tagging both about 35min after crossing the PCT. There is a good view looking south from Peak 11,245ft to the more daunting Peak 11,260ft a mile away and Leavitt Peak beyond that. The crest grows narrower and more rocky, unfortunately the quality a bit lacking. It would take almost an hour to get to Peak 11,260ft, a moderately enjoyable scramble (I would rate it much higher with more solid rock). Someone had fixed a line at one point though none of it was more than class 3. 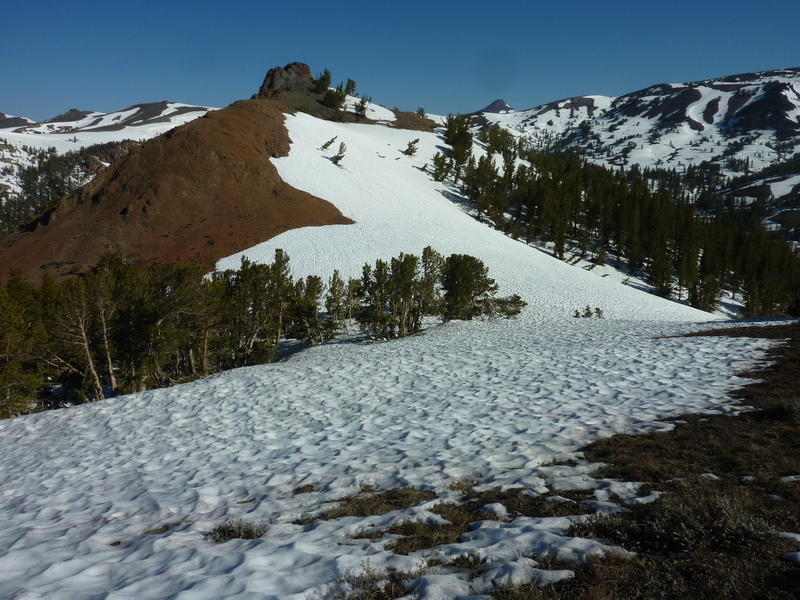 From the summit there is a fine view of Leavitt's NE Ridge, nicely clear of snow. The upper part of this looked like it might present some difficulties (it didn't) and caused some minor worry. The safer route would be to the left, across the snow and over to the easier SE Ridge, but I had done that twice already. The NE Ridge proved slightly easier and more fun than I expected, taking me another hour to complete the 3/4mi traverse, no more than class 3 in a few places. Leavitt's summit cairn has been dispersed and the register gone, sadly. The top is flattish, making an exact highpoint hard to pinpoint without the cairn. As it was only noon, I decided to extend my original plan and tag a few extra summits. To the northwest was something called Leavitt West on PB, but not possessing sufficient prominence to really call it a separate peak. Though I didn't count it in my stats, I paid it a visit anyway since it looked moderately interesting. It has a smaller summit footprint than Leavitt and provides a fine perch for views of Kennedy Canyon, Lake and Creek to the south and west below. After returning to Leavitt for a second time, I spent the next hour and a half continuing along the crest up and over Peak 10,870ft and Peak 10,940ft, the latter about 1.5mi SE of Leavitt. Neither of these demanded anything more than class 2 and made for a leisurely continuation of my outing. It was 1:45p when I was atop this last summit and decided to call it a day. The next peak to the south was more than 1.5mi away with a difficult-looking stretch along a lower intermediate point on the ridge - better to save that for some trip when I can drive to Leavitt Lake, just below me to the east now. One of your better photo compositions for sure. I concur with Anonymous above. However, I would like 'honorable mention' 2 more of Bob's photos from his Trip Report archives. Specifically, 8-6-04 Photo #47 and 6-8-12 photo #59.